This salad is not skimpy on the flavor. I meant it to be a wrap, but it kept falling apart…so a salad it is! 🙂 If you’re more organized than me and can eat a salad wrap, try that. Chop celery and scallions. Set aside. Combine marinade, oil, orange juice, honey and soy sauce. Mix until combined and set aside. In a skillet on the stove, cook ground turkey until no longer pink. Salt and pepper to taste. Pour in marinade and bring to a simmer. 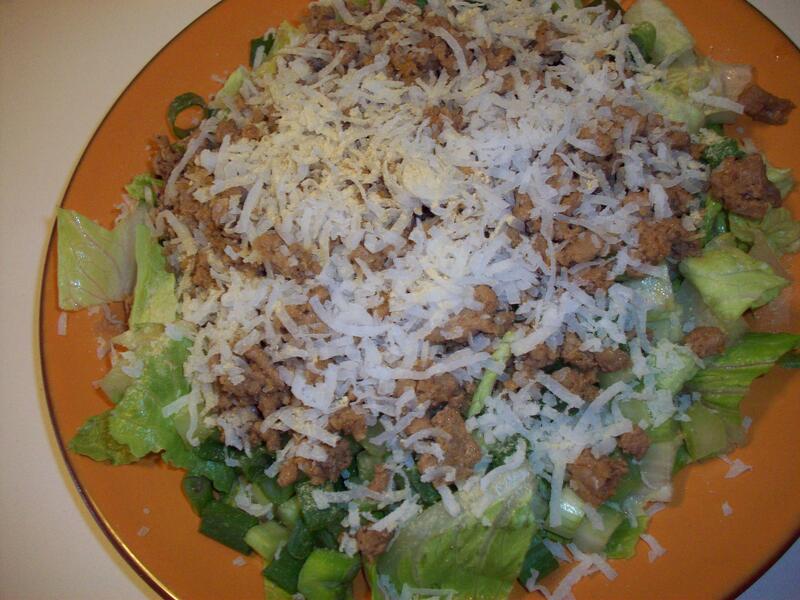 Place salad on a plate and top with celery, scallions, and meat. If desired, top with coconut and ground ginger.